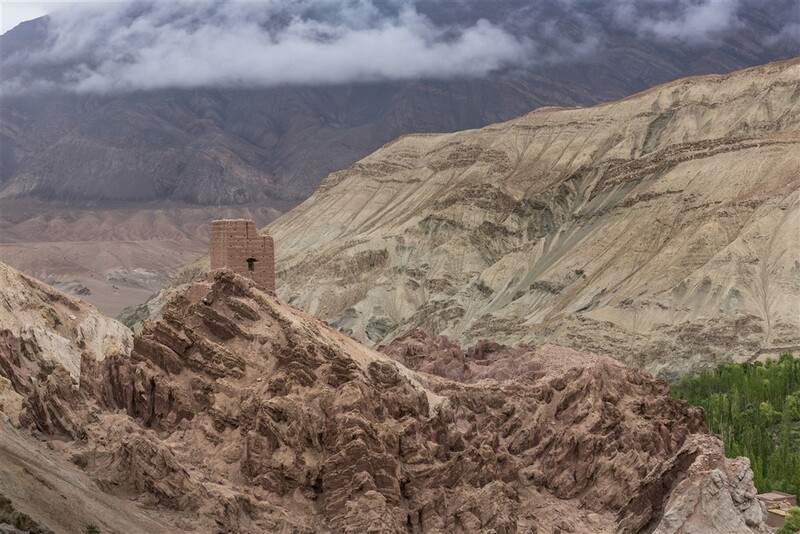 Last year during my first visit to the Ladakh region I was totally captivated by Basgo. It was without doubt my favourite location for a multitude of reasons, mostly down to the crumbling atmospheric buildings set against a wondrous landscape quite unlike anywhere else I have ever experienced. That day came sooner than I thought. 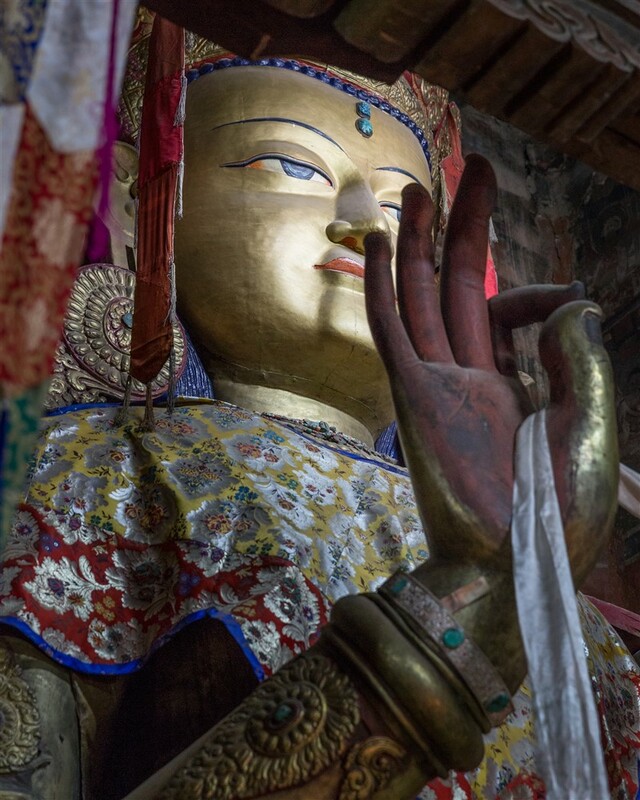 Just a year later I was back in Ladakh, and revisiting Basgo was high up on my list of places I wanted to explore again, with the hope of this time gaining access to those elusive temples. 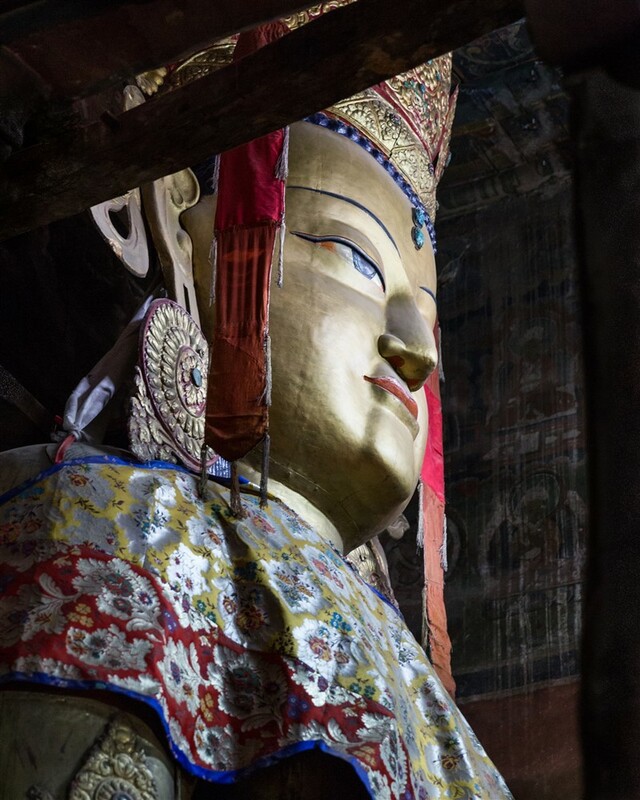 Luck was on my side so it seemed, mostly thanks to my driver who went out of his way to find what appears to be a caretaker that now lives permanently at the crumbling palace (at least for the summer season). 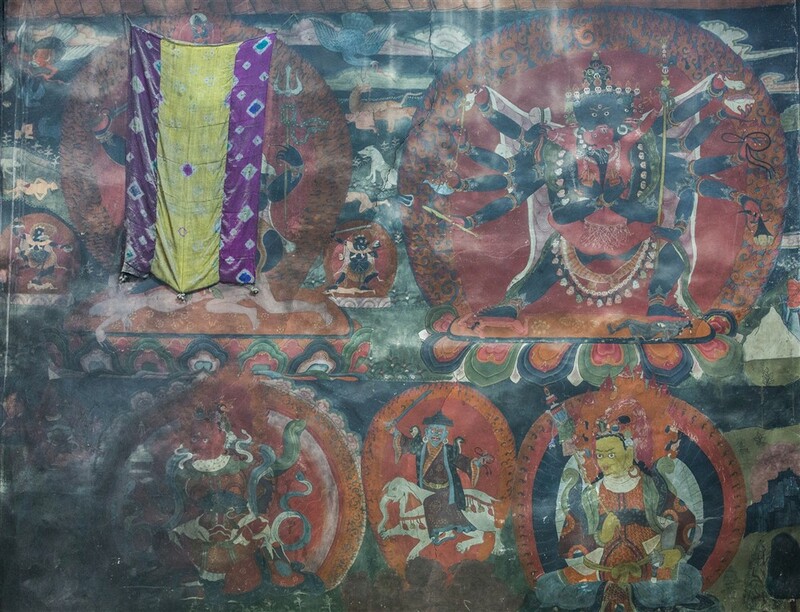 Your best chance of finding him seems to be to head for the central open courtyard in the ruined palace, and basically shout quite a bit until he appears. Unconventional perhaps, but my driver seemed to think this would do the trick and he wasn’t wrong. 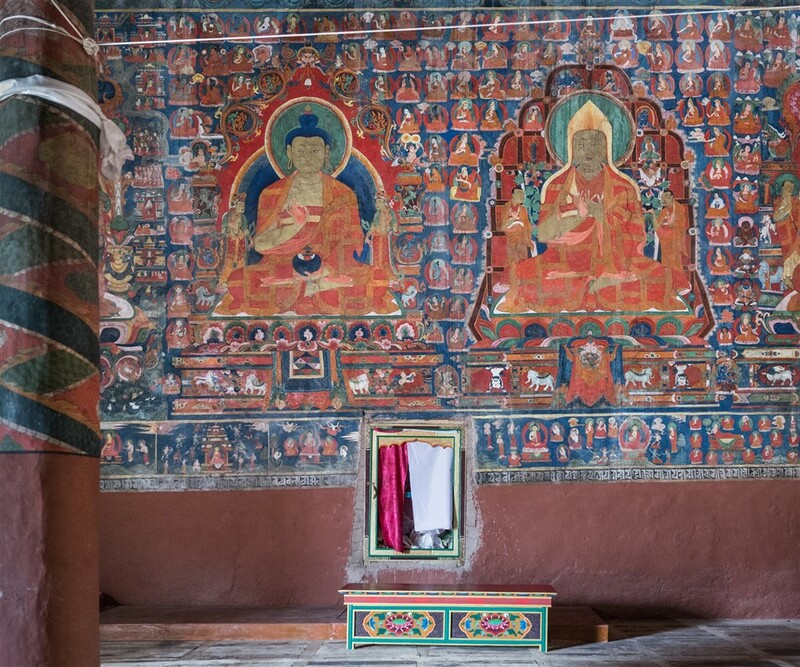 On the walls are stacked volumes of the Tibetan Buddhist scriptures, the Kangyur (Buddha’s sayings) on the left, and Tangyur (commentary and interpretation) on the right. 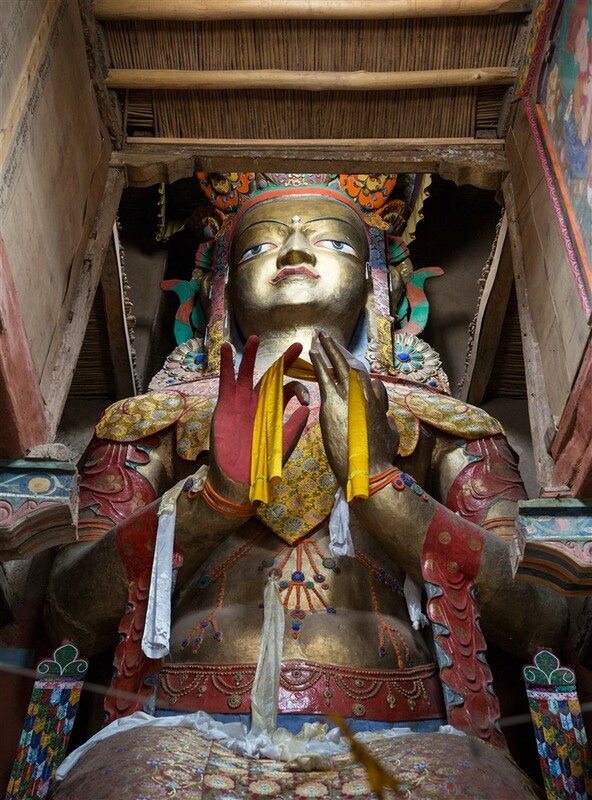 These writings are mostly inscribed in copper and gold and is how the temple got its name; “ser” in Tibetan means gold, and “zang” means copper. 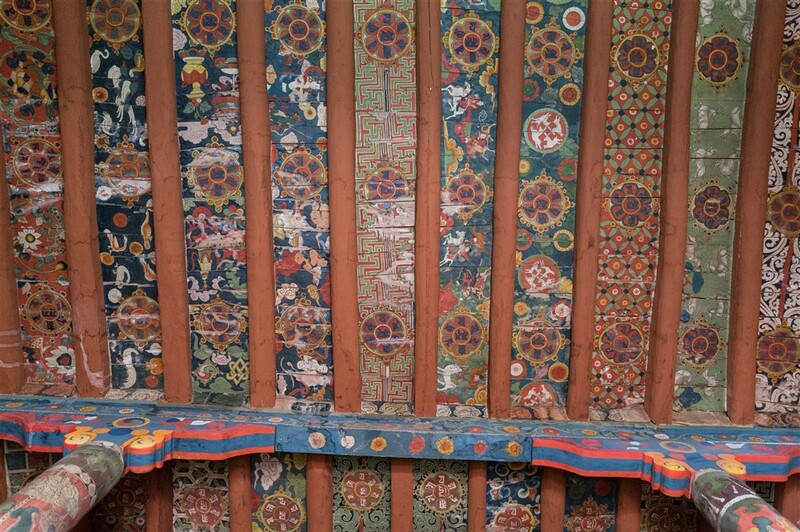 The walls are richly decorated, making the whole space extremely atmospheric and peaceful. 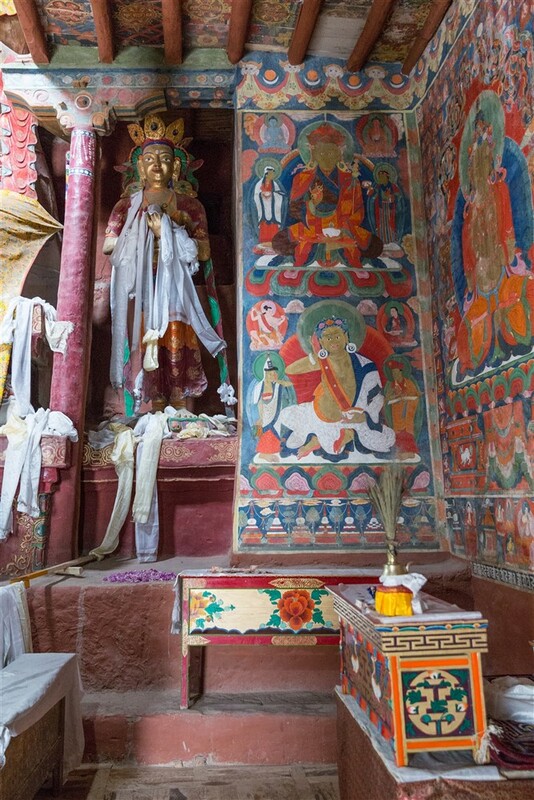 Leaving Serzang Temple we then headed uphill to the largest temple of Basgo. 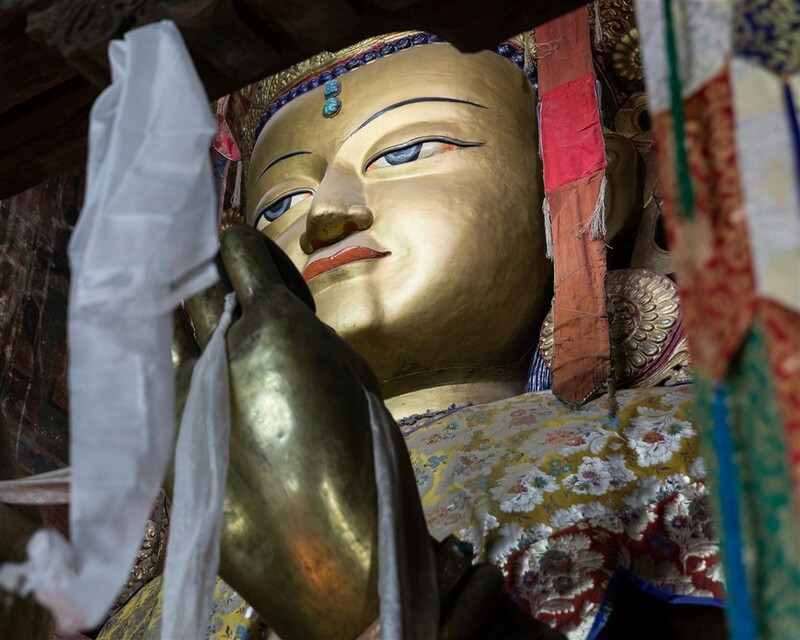 Chamba Lhakhang stands above and detached from the ruined palace and is reached via a flight of steps. 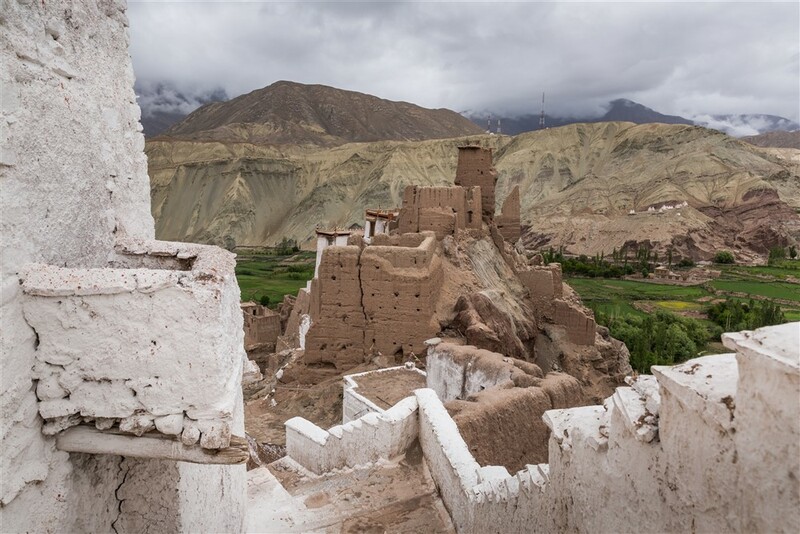 This is a great place to look back and take in the amazing views of the palace, lush green valley with cultivated fields, and the rugged mountains beyond. 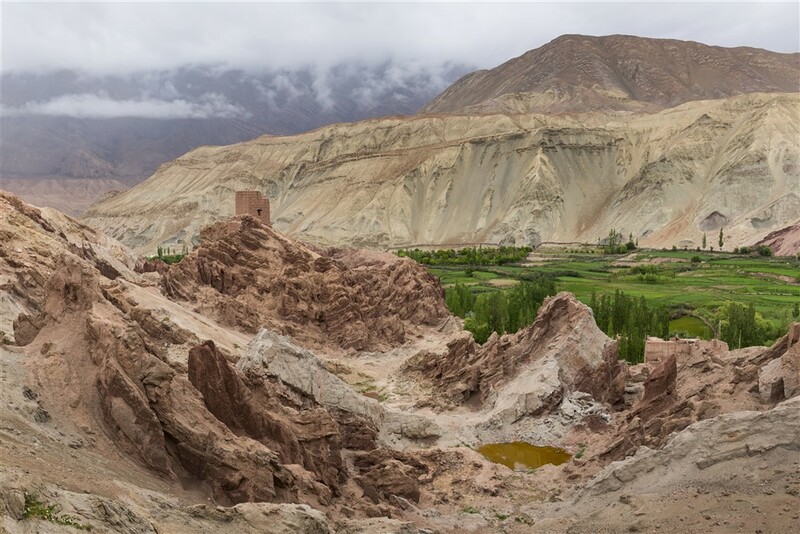 My previous blog post on Basgo has perhaps more spectacular examples of the landscape that envelopes Basgo. 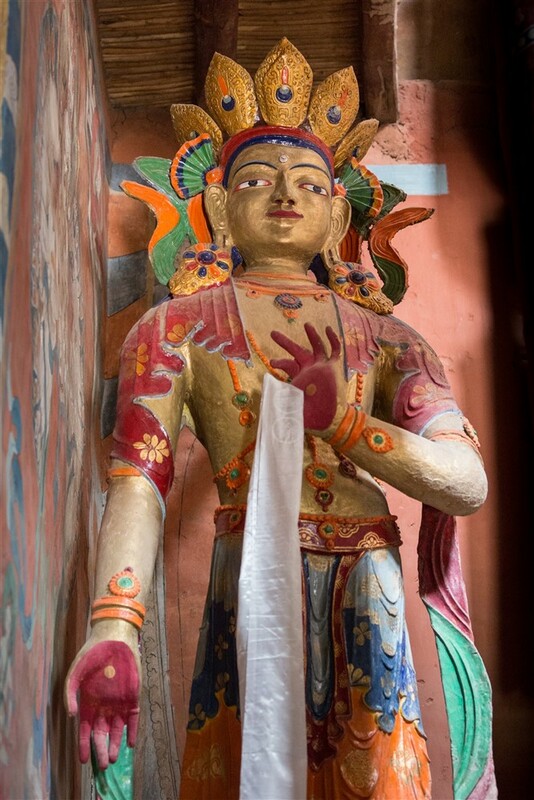 The Chamba Lhakhang temple is simply stunning. 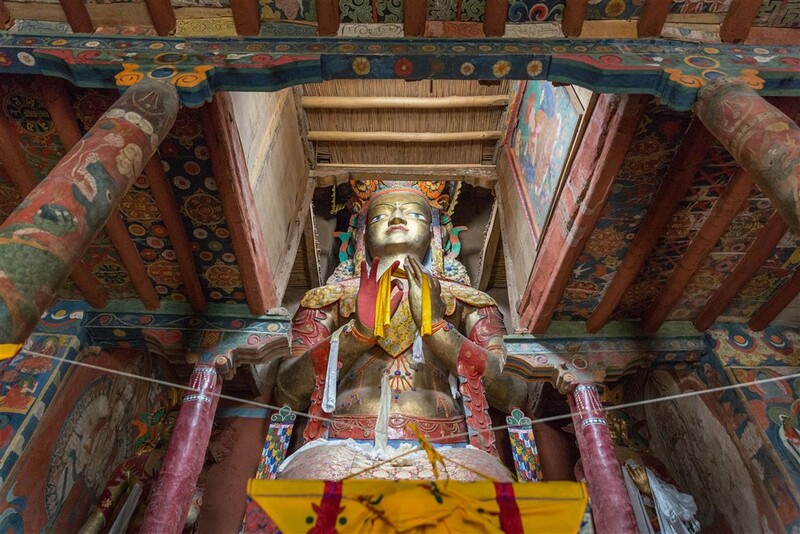 Housed within is a colossal statue of Maitreya surrounded by superb murals, even the ceiling is richly decorated (one has to always remember to look up in such places!). 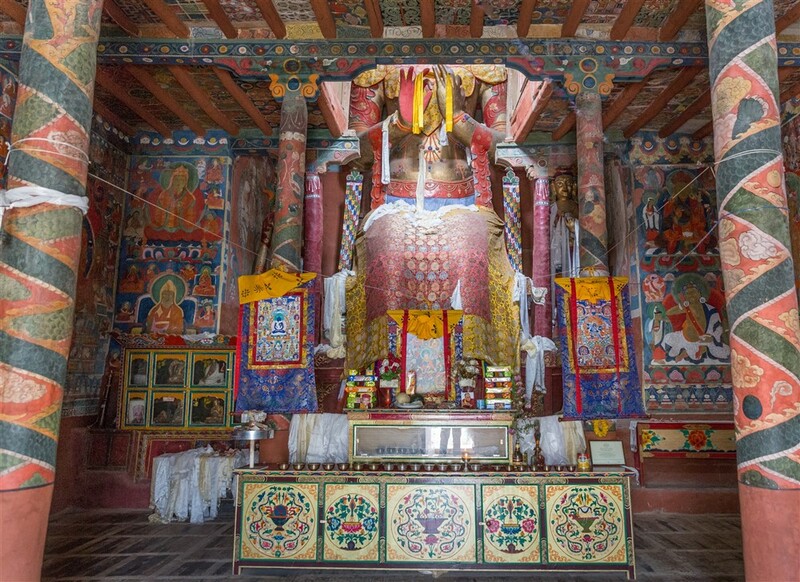 David Snellgrove, a great British scholar of Himalayan Buddhism, described Chamba Lhakhang as “perhaps the most beautifully painted temple in Ladakh, after Alchi”. 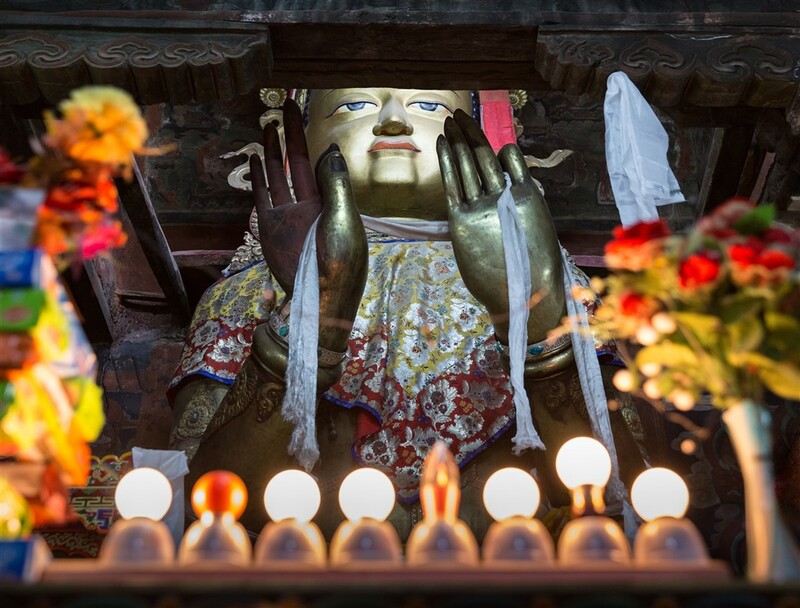 It’s hard to argue otherwise having now visited many temples in the region, but for me this was made all the more special by having the entire place to myself. 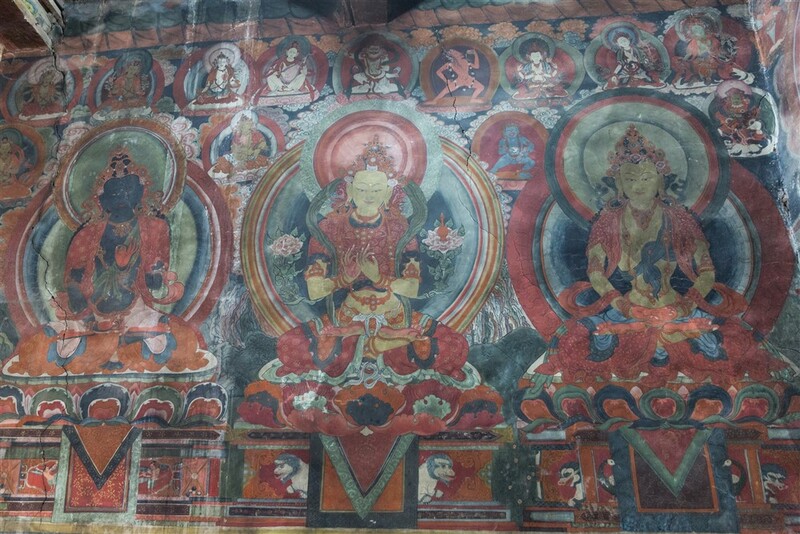 The paintings date back to the 16th century when the temple was refurbished by King Tsewang Namgyal. 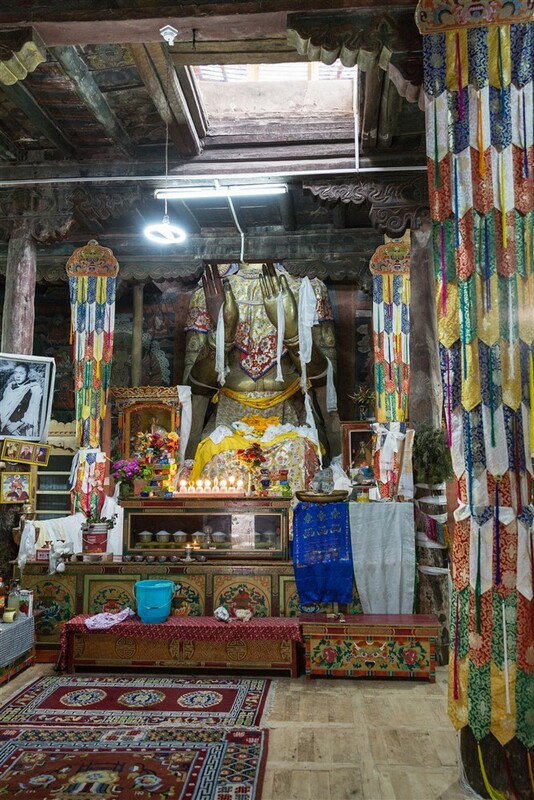 It’s believed the original shrine was built in the 15th century by King Tragspa-bum, and more recently the entire temple has been painstakingly restored by artists from Delhi, after damage resulting from water seepage. 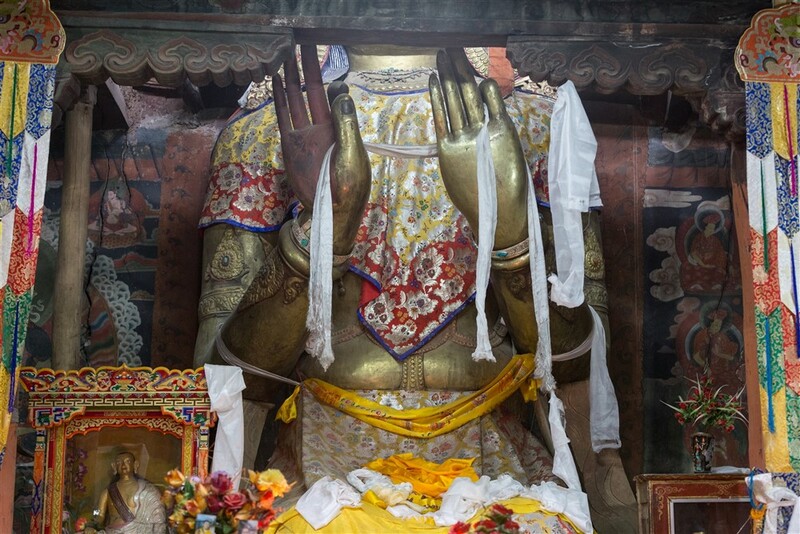 The seated Maitreya is simply gigantic, you can see its head only when you step up close to the feet. 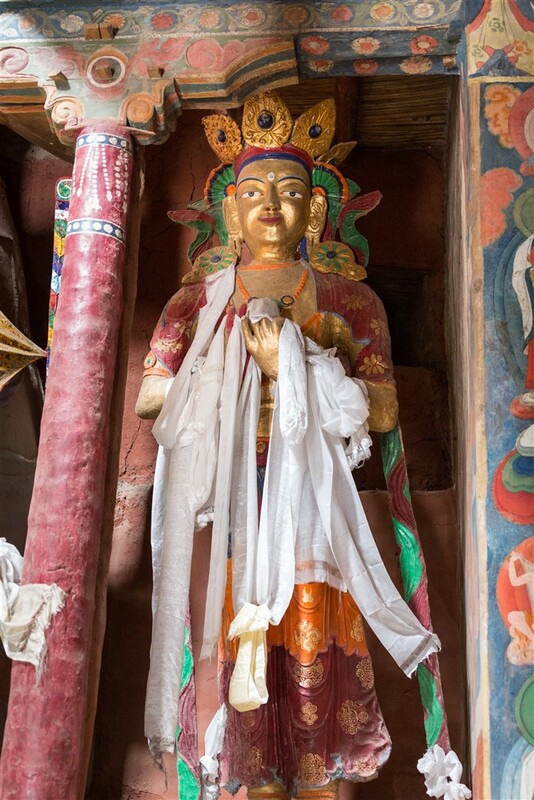 The three storey 9m high statue is flanked by two smaller Buddhas; one of the right making the mudra gesture of generosity, the one of the left preaching. 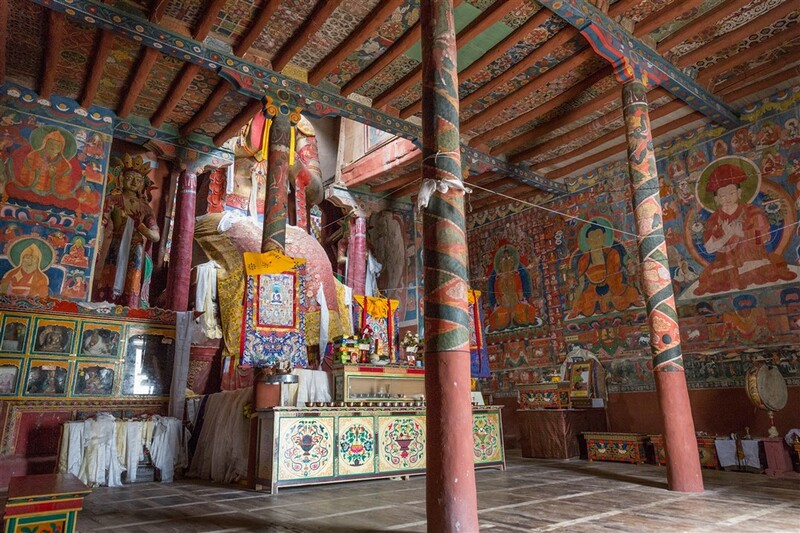 Continued restoration of all the basgo temples and citadel seems to be on-going, mostly by residents of the village under the initiative of Tsering Angchuk, a local civil engineer. 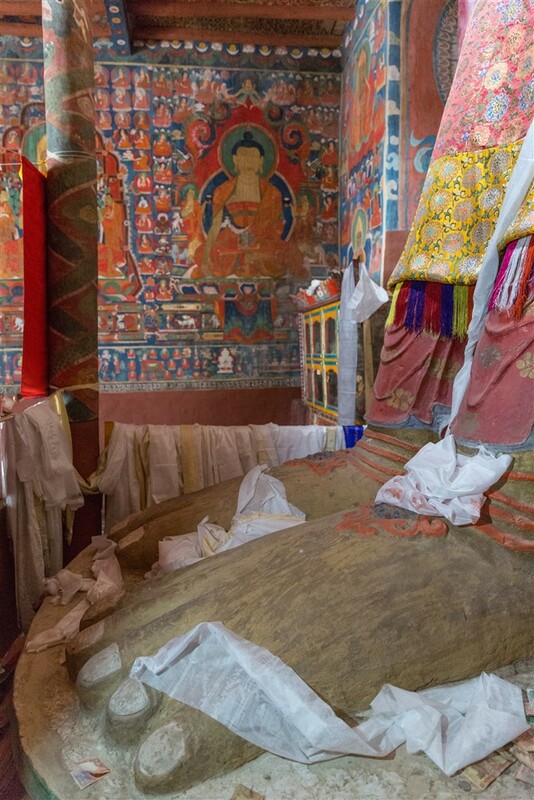 This has been supplemented by the Tibet research organisation, funds have been raised, and now organisations such as UNESCO and WMF (World Monument Fund) are interested in the efforts to save the structures. 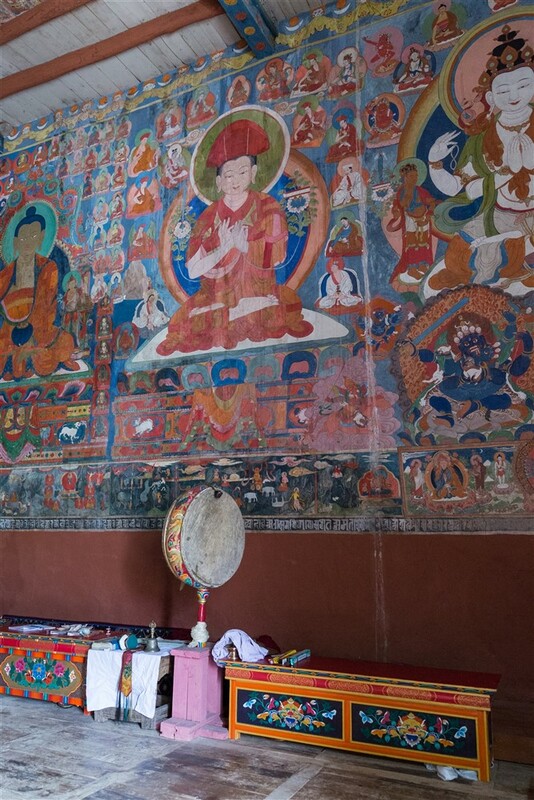 In 2000, WMF nominated Basgo to its list of 100 most endangered sites, which resulted in donations from international banks towards the restoration work. It’s great to see progress being made, with the ever fluctuating climatic changes in the region (most notably the unseasonal high amounts of rainfall of recent years), these structures are in desperate need of stabilizing, restoring, and most importantly continued monitoring so the regions heritage is preserved for generations to come. 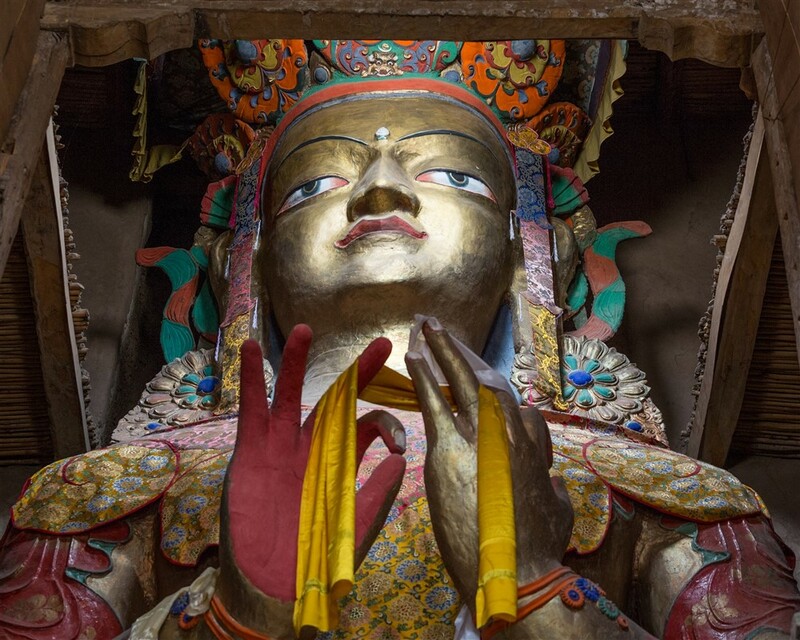 Anyone visiting Ladakh should have Basgo high on their list of places to visit. 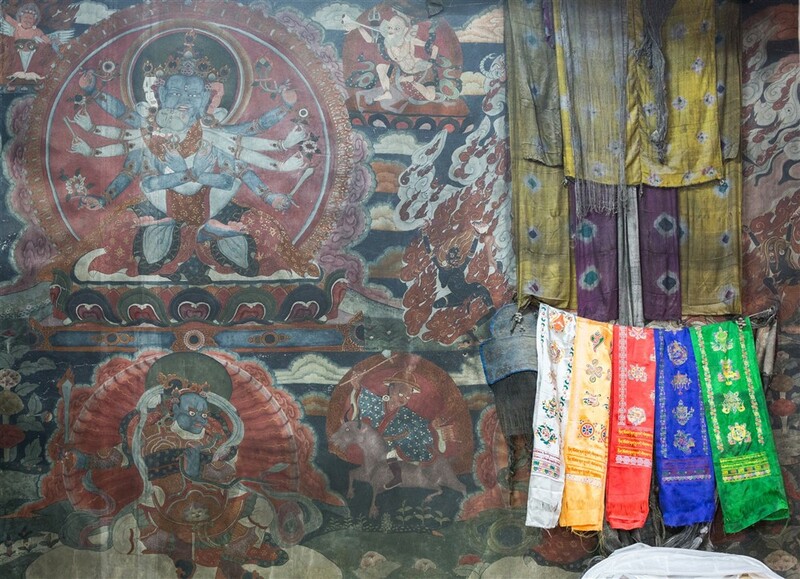 Slightly removed from the more popular tourist temple tours, you won’t be disappointed. It’s the perfect blend of heritage, architecture and landscape – and a memory that will perhaps last the longest as you reflect back in subsequent years. You simply never end to surprise me. 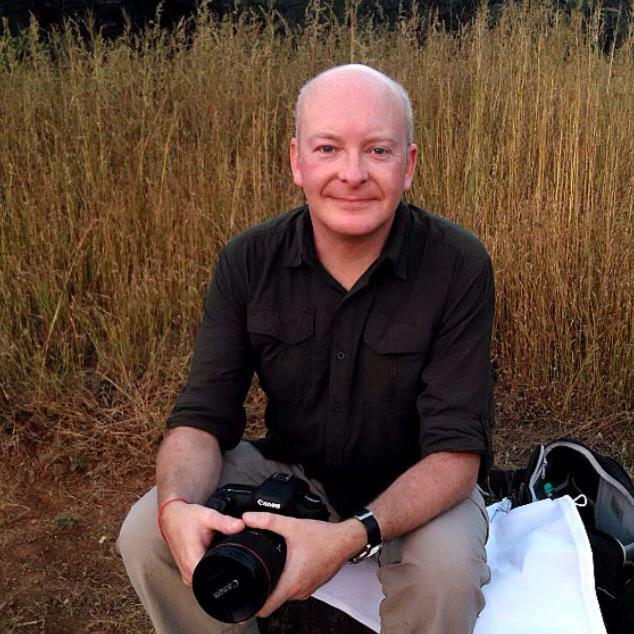 Many thanks for your passionate contribution to my dreams…..
Beautiful photography! Thanks for sharing, and a really informative article too. I’d love to visit there, having read your post. Good stuff. Thanks Robert for your kind words !